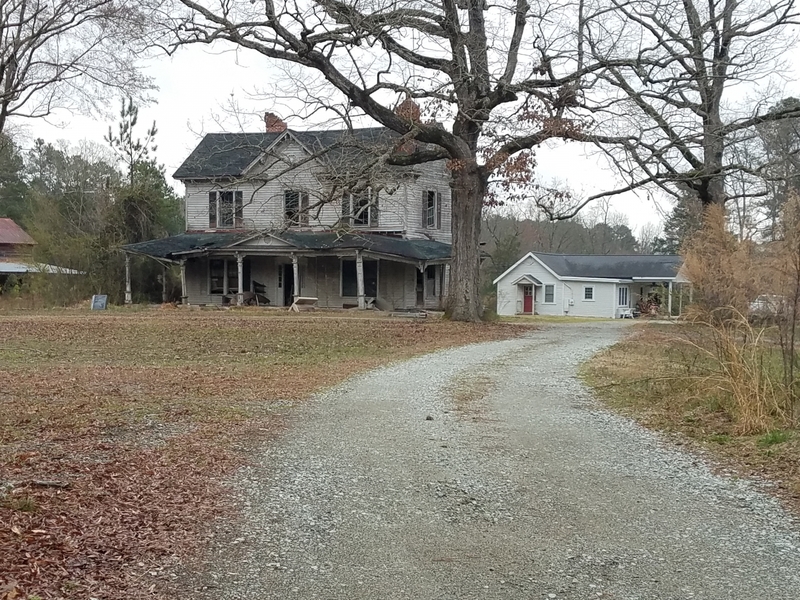 I live near the Bragg house, and I'm horrified by how badly it's being neglected. This is a real heartbreak. The house is just a decayed shell, and it wont't be standing much longer. It's so far gone that it probably can't be saved. A real shame. Both the three black-and-white photos and the text in italics are from the Durham County Historic Architecture Inventory (NE-8 and NE-9). 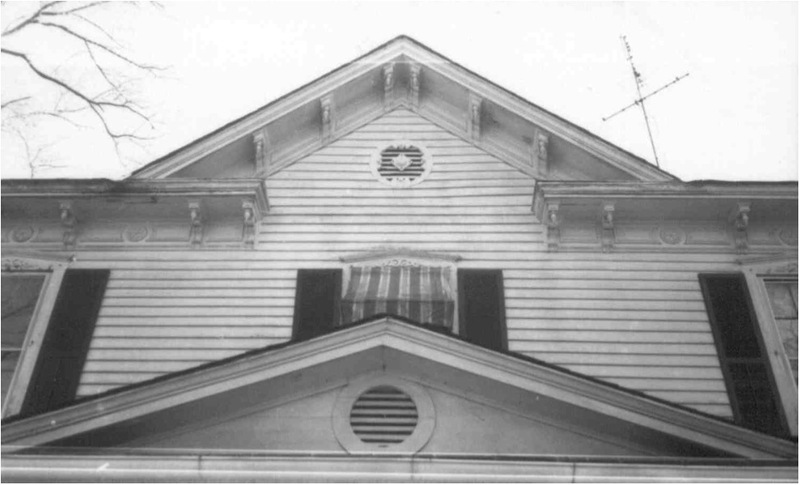 The Triple-A I-house form so common to Durham County, features here an elaborately paneled frieze board with scrolled brackets and teardrop pendants, polygonal vents on each gable, a pedimented entrance flanked by sidelights, and interior rear chimneys with fancy corbelled stacks. 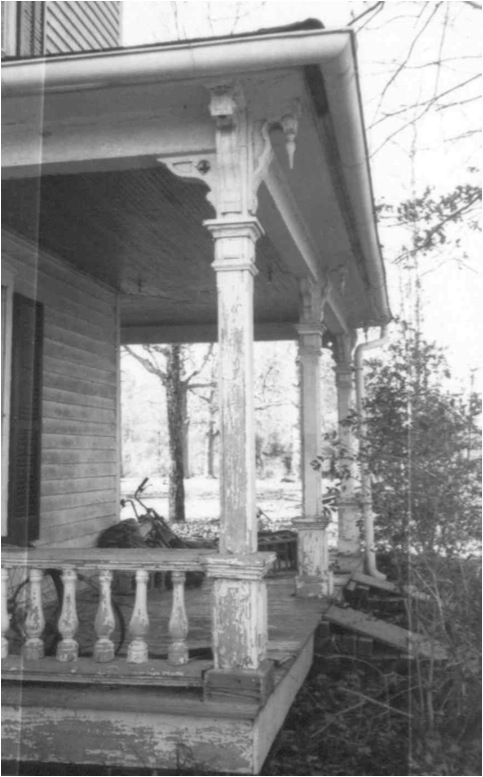 A wraparound porch has paneled porch posts and a heavy turned balustrade. Pedimented lintels with decorative sawn work appliqués enhance six-over-six double-hung sash windows. A full-width rear shed is thought to have been built at the same time as the house for windows exhibit the same decorative features and the frieze board is bracketed. (1) The Johnston 1887 map of Durham County shows that both the Morgan and Holloway families had large land holdings in this area. Durham County Deed Book 36, page 392, records a transfer of 109 acres from S. T. Morgan to W. T. Holloway on 21 February 1906. Within the next nine years, Holloway inherited 10 acres from his father, W. D. Holloway. On 11 October 1915, in Durham County Deed Book 49, page 130, W. T. Holloway conveyed 118 and 5/8ths acres “being a part of the Morgan Lands and The William D. Holloway Land.” to J. L. Martin. Durham County Deed Book 57, page 561 records Martin’s sale of the same parcel to Cleveland Bragg on 11 December 1919. Durham County Deed Book 85, page 92, releases any interest T. M. and Nettie Washington had in the property to Cleveland Bragg. (2) Personal interview with owner Danny Roberts, 7 August 1996. Mr. Roberts reported that his children have thrown most of the grave markers in the well. 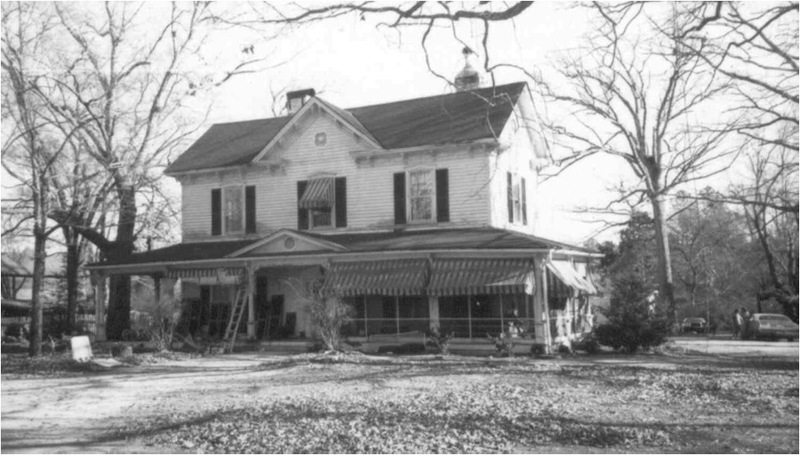 The Cleveland Bragg house still stands off of East Geer Street not far from its dead end by Falls Lake and the Lake Ridge Aero Park. Time and the elements have taken their toll, however, and this old gem might not be around much longer. The same family as interviewed in the mid-1990s appears to still own the property, though the main residence seems to have been the newer, adjacent home for some time. This building was the subject of a What's It Wednesday?! post on Open Durham's social media accounts (Facebook and Instagram), the week of March 13, 2019. Follow us and stay tuned for more finds!